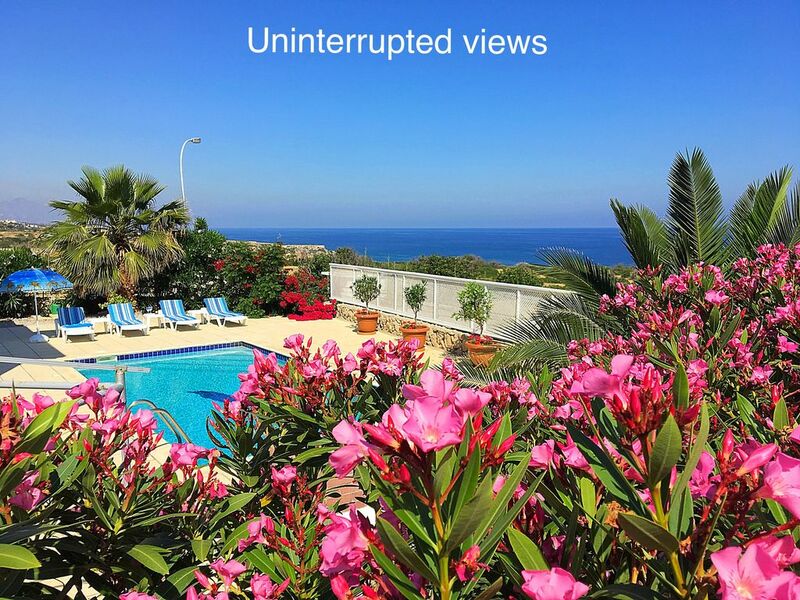 Sunset villa has a private swimming pool overlooking the Mediterranean and the 5 finger mountain range plus an outside shower and barbecue in the lovely mature gardens. Easy flat access, unlike many. There is a path adjacent to the villa which takes you down to the supermarket, Slimz cafe, local beach, beach restaurant and local marina. Magnificent sunsets and Stunning uninterrupted sea and mountain views. PlayStation and games, wii, golf equipment available at no extra charge. Two mountain bikes. Huge library of films, books, games. Every conceivable luxury to make this a holiday of a lifetime! The villa has a large open plan air-conditioned lounge and dining room, kitchen with washing machine, fridge/freezer, dishwasher, microwave, halogen oven, coffee machine, soup maker, ice maker, drinks dispenser. Separate TV room with internet, satellite, wi fi, TV/DVD and Wii and PlayStation, cloakroom. 3 double bedrooms, 2 with terraces, one with massage adjustamatic single bed, 1 with en-suite shower room. Magnificent views of the Mediterranean, mountains and glorious, breathtaking sunsets! The villa is furnished to a very high standard with Laura Ashley furniture, curtains and soft furnishings. Not suitable for small children. Outside we have a covered terrace, an abundance of sunbeds,three hammocks, tables and chairs. Fly screens and air con. Walk to the stunning local beach with showers, changing rooms and fabulous restaurant. Walk across the field to the huge Tempo supermarket with its takeaway section. The established gardens are a lovely feature of this villa. For 2017 the villa was transformed outside with champagne aluminium and glass terraces and new outside tables and chairs. 2018 a new covered car port and sun screen over the front terrace with pull down blinds when the sun gets too hot. If you are bringing anyone with a bad back the beautiful yellow room has two single beds, one is a Adjustamatic massage bed with a remote control to higher the back and bottom of the bed. If you don't feel like cooking breakfast take a short stroll to the Slimz cafe, full English breakfast with tea and loads of toast £5 ! We were there in Nov 2018 7 lira to the £. It's just not worth cooking, the food is so reasonable. The coconut bar do tapas on a Saturday, lovely ambience, the Almond tree food is first class, the Elexus hotel nearby do Sunday lunch, all you can eat with fine wines and use of their facilities £15 per head. The Chinese restaurant there do a 8 course set menu with as much wine as you can drink £25 per person. Visit the beautiful village of Karmi and have a meal in the Levada restaurant. All the restaurants have musical evenings and the food is of a very high quality. For shopaholics, Kyrenia city has lots of shops and there is a new shopping mall on the way to Farmagustos which is really nice. Outgoing, happy people lover Want everyone to have the best holiday ever so have gone to great lengths to ensure everything is lovely with loads of extras. That's easy - we give you 100% support before you go with access to totally reliable transfers and car hire and here to help in anyway we can. When you get there Chrissie and Mick are on hand should you need them - it's all about a stress free holiday and support if and when needed. Don't under estimate how useful this is to have the assurance of an English speaking couple on hand to assist you if you need it. Surrounded by outstanding countryside with a local beach just a short walk away with showers and changing cubicles plus the restaurant just a few metres from the sea, idyllic! Easy flat location so can walk to the huge supermarket, local marina and local beach. Driving on the same side as the uk and brilliant roads. Same electric as UK. History freaks so love the castles, ottoman and roman settlements all around - great walking, climbing, fishing, boat trips and places of historical importance. The villa is surrounded by Roman history, if you join the Roots ramblers they can explain the history all around this area. Farmagustos is well worth a visit and now apparently has a huge shopping mall. If you check the reviews on trip advisor you will see that the villa has just about everything you need plus! Everything has been organised for a stress free holiday from Sertec who picks you up from the airport, drops your hired car outside the villa. Three outside hammocks, one bamboo hammock/bed on the first floor terrace should you wish to sleep outside. No cheap furniture and equipment here unlike so many others, beautifully appointed throughout. Immaculately clean with mattress and pillow protectors on all beds huge amount of beach towels and just about everything you could possibly need will be there somewhere. All tourist info is at the villa, tourist books and maps on everything, plus we send you a Word doc of the villa, 22 things that you should not miss doing whilst your here, all contact info for turtle watch, fishing, golf, boat trips, scuba diving, etc etc. Plus all the latest info on the local area, like the new Elexus hotel down the road which has several amazing restaurants including Chinese - Sunday you can enjoy the whole day there, beach, the magnificent infinity pools, water park, jacuzzi etc - all you can eat and drink all day for £16 each - 6.7 lira to the £1 (fluctuates) incredible value wherever you go with the food of a standard you would not expect. Because sunset villa is in a flat easy location surrounded by mountains on one side and the sea over to Turkey on the other side it's so convenient for walks up the mountains opposite, huge supermarket worth a take away section, walk to the beach with its own almost in the sea restaurant. So not having to get in the car all the time, there is a bistro bar a few mins walk away with football etc. Before you go download the www.thewhatsonwhere.com which will give you all the info on what's on in the area, if your a keen walker join Roots bar ramblers on Facebook for all the latest rambles and the bar/restaurant is fabulous too, loads of atmosphere! A must!! See trip advisor for reviews. Walk across the field or take the path from the villa. Restaurant on the beach plus changing rooms and shower facilities. Washing machine, full size oven, microwave, dishwasher, Cappachino machine, Halogen oven, Ice maker, soup maker, George Foreman grill and griddle, hampers, freezer bag. Lovelyviews over the sea. This is such a lovely place to stay! It is not overlooked being on the edge of the estate, with panoramic views of the mountains and the sea. It is called Sunset Villa for good reason, the sunset each night is amazing! The villa itself is very well appointed and light and airy. The outdoor spaces are lovely, with many different seating areas all round the property, with a barbecue area and of course the lovely pool. Julie has added lots of personal touches to make the stay extra special. It is a quiet part of the island, and a car is essential, but that suited us fine. It was great sitting out at night with a glass in your hand looking at the stars and listening to the ocean. Restaurants, beaches and shops were all a short drive away.Lots of lovely castles and historical places to visit too, with bargains galore in Kyrenia, which is about half an hour away. Thank you for this lovely review especially as it was your second visit to Sunset. Lovely villa peaceful location what you see is what you get. The local people are really nice most speak English, the food is good and not expensive and a lot of the local restaurants will pick you up and drop you off so you can have a few drinks which is a really nice touch. The villa itself is lovely really well appointed, spacious and basically a home from home with everything you need for a comfy stay. Julie's friends, an English couple who are very friendly, live nearby and pop over to check all is o.k. which is reassuring. The pool is graduated and is maintained twice a week. An Ice cream van drives past daily, just go to the villa gate & flag him down, think we tried all the delicious different flavours around £1.30 each for a huge cone. You are asked to be careful with electric and water as both are expensive in Cyprus but we had plenty of both. The water cooler in the kitchen was a nice touch, we got through loads as it was in the high 30's when we were there in July. The ultimate test of any holiday is whether you would go again and for us the answer is a resounding YES ! though I think we would try to go when its a bit cooler either earlier or later in the year. We stayed here from the 9th June 2015 to 20th June 2015, I first found the owners to be very accommodating and helpful as we had never been to Northern Cyprus before and I was a bit wary. We stayed in the Sunset Villa which was lovely and had everything you needed for the stay, We also stayed at the Sunrise Villa which is just as nice. I would highly recommend both of these villas and the owners as they cater for everything you need. The area is lovely and we will be staying here again, We went out everyday as there was so much to see and do and everything and everyone were so nice I had a very enjoyable stay. I would recommend eating out as it is so cheap and really not worth staying in, and the restaurants around are very nice and the food is great. The taxi I used was Bellapais and they did the hire car as well they were recommended by Julie who owns the villa and they were on time and very good. Overall I could not fault my trip and I had a very enjoyable stay this is why I would recommend this villa and I will be booking again. A stay at Sunset villa is everything you hope for and more for a very relaxing holiday. It is beautifully presented, so clean and caters for your every need. Everything you need is there, including things you don t think you need but suddenly become invaluable. The pool is just the right size to be able to swim and cool down. The location is peaceful and remote enough to be quiet yet near enough to plenty of restaurants. I would suggest a car as there are so many beautiful places to visit nearby. Northern Cyprus is very reasonably priced, we ate out most evenings. You will not be disappointed if you stay at Sunset Villa it is simply perfect. The scenery is beautiful and there are so many places of interest like the beautiful Kyrenia harbor, Salamis, Kalaman,the monastery at Bellepais. Superb boat rides around the area, lots of dolphins and turtles. Hundreds of restaurants. For full details of all this and more we can email you a Word doc with all the recommended sights and restaurants. There is a scuba diving school and club and catalkoy riding club. The Korinium golf club has a spa and Beach club which are very sulerb, the ultimate in luxury and make sure you ask for the special deals first! There are some outstanding facilities in the new Elexus hotel and within a 14 min drive with a stunning beach, huge infinity pools, water park, absolutely amazing facilities and Sunday lunch and the Chinese restaurant are a must! Also some of our guests have thoroughly recommended the Turtle Watch, you need to go to Alagadir beach 3 to book this, its a night watch! All tel numbers in the villa. 8 minute walk across the field to the local beach with its huge restaurant on the beach plus changing cubicles and showers. Salamis has a stunning beach, suggest you go there to see the roman ruins and take a picnic and swim things as the beach is amazing. There is a restaurant there but a picnic is the best, picnic hampers, cool boxes, flasks etc at the villa. Just been down the Karpas region, the beaches are stunning with the golden sands beach and the Karpas marina with its fabulous beach club which is £6 to enter and you can use all their facilities, luxurious and the food and the infinity pool. Ercan airport is 35 minutes from the villa along a very easy route. Larnaca is around 1 hr from the villa. Car rental is essential but very easy to drive, they drive on the left like the UK and the roads are so easy and good but driving in Kyrenia itself until you know the way can be a bit of a headache. Our reliable guy Sertec can pick you up from the airport and it's 55mins to the villa and he will drop a car off for you too, no stress all easy and reliable. Walking distance to supermarket and local beach and restaurant. 25 mins to Kyrenia town and harbour (Girne). 35 mins to Ercan airport, 1 hr from Larnaca airport. 10 mins drive to Turtle beach (there are three turtle beaches, the best is Alagdir 3), the sign post is huge you cannot miss it. go through the large metal gates. It's an amazing beach. 14 mins by car you come across the new Elexus hotel which has many different restaurants including Chinese, you can have Sunday lunch there all you can eat and drink all day and enjoy the infinity pool, jacuzzi, several children's pools and a water park for around £16 each. It's very luxurious. Also closeby is the stunning Korinium golf club which enjoy breathtaking views and the ultimate course for the discerning golfer and a fabulous pool and spa for the ladies. Opposite the golf club they have their own beach club and restaurant, again absolutely lovely. A new petrol station has just been built on the main road just before Esentepe village, and there is a large new supermarket within walking distance of the villa take the path over the adjoining field. Superb restaurants closeby, Stevies Restaurant, Joya, The almond tree (spectacular food), the coconut bar (tapas on a Saturday is divine), gorgeous bar, the castle, in fact there are so many places to eat its difficult to choose and we have not tried them all so let us know your favourite. All the cards for the restaurants are in the villa plus there are plenty of restaurants within a few minutes drive and the Golf Club is really good - NOT expensive but really luxurious. The spa is also very, very good with massage and lots of treatments (great whilst the men go and play Golf). The golf club looks like a Palace, it is so magnificent you cannot believe its a golf club, all marble and beautiful sitting out areas with uninterrupted views of the mountains, sea and surrounding countryside. Do not miss this even if it is just to go up and have a coffee. You are allowed in, no problem. Note: Northern Cyprus is not governed by the Euro or the Dollar so holidaying here is still excellent value! Drive on the left like the UK. We have been up to Bogaz, there is a fantastic new road to the Karpaz peninsula and a huge new up market marina.. Dont miss the Levada Restaurant at Kalaman - a stunning village, full of history, but its on a steep hillside-book in for Sunday lunch. Important note: We have drawn up a very comprehensive Word doc of all the sights and things to do that you must not miss on your visit. We are here to help and you have Mick and Christie on hand who live closeby if there are any problems and Tim who lives Closeby looks after the pool twice a week. The gardens have to be watered twice a week too.